Katherine Rode, R.N. and Mary Ann Grobbel, M.D. A full-year science and health program with a Catholic perspective! This hands-on human anatomy course is designed to be given to your student to work from independently. Course teaches about the function and location of many of the organs God has designed in the human body. A beautiful pro-life thread runs throughout the course. As a wrap-up activity, student will make the "Human Body Felt Project," an inexpensive and wonderful teaching tool your student will be proud to have made. Patterns included. 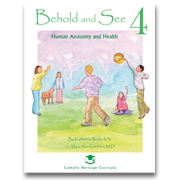 This is an excellent overview of health, nutrition, and safety from a Catholic perspective. Simple, clear terms explain nutrients and how to create a balanced diet as well as the ins and outs of disease, hygiene, exercise, and more. Includes basic First Aid instructions for a variety of medical situations from bug bites to frostbite. Answer keys included. 188 pgs. Spiral-bound for ease of use. 8½"x11"